As part of the annual Worldwide Vegan Bake Sale campaign, we are hosting a Vegan Bake Sale Fundraiser! Vegan Society of P.E.A.C.E. has participated in this campaign every year since it was created! This event will be held at the UU "Music, Peace & Justice Festival" on Saturday, March 23, 2019. The festival is located at the Unitarian Fellowship of Houston on Wirt Road from 2:00 - 9:00 PM. The outdoor music festival will have kid's activities, arts & crafts, lots of live music performances, hula hoops, henna, belly dancers and more! FREE ADMISSION! 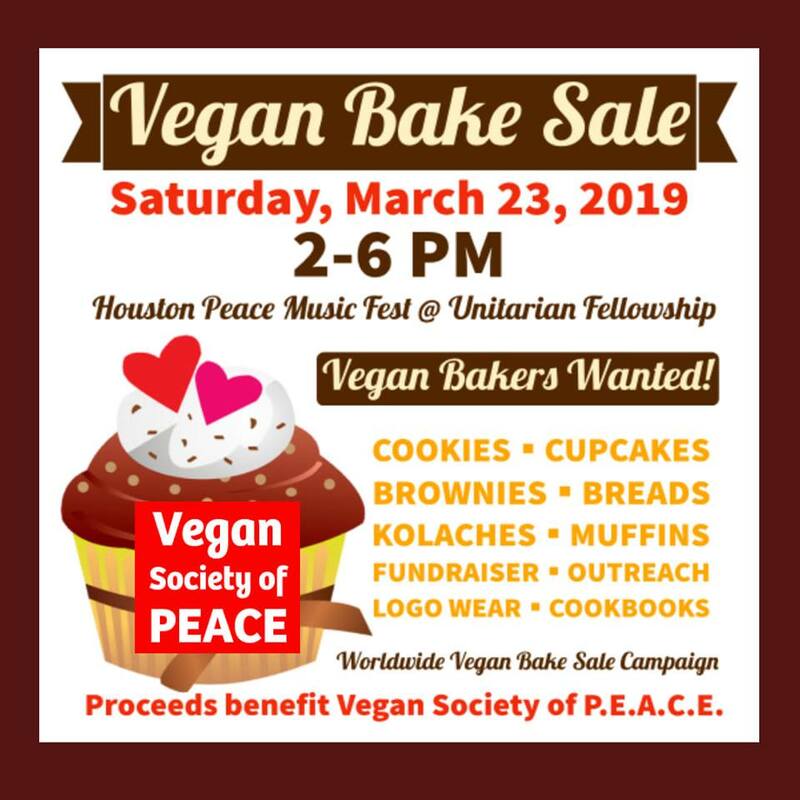 Visit our Vegan Bake Sale booth from 2-6 PM for a variety of sweets and treats, vegan books and shirts! We will also have free Vegan Starter Guides at our Outreach Booth. Vegan Food Truck Korny Vibes will also be at the festival. Vegan baked goods donations wanted! Please email us if you would like to donate vegan baked goods. This fundraiser supports our 7th Annual VegFest Houston!